A while back, a good friend who knows all about my love of Crocs, told me that she heard Crocs was going under. Except for the sneakers that I wear when I force myself through the doors of the gym, Crocs are the only shoe I’m seen in. I have Croc sandals (and I just bought this style also), basic Crocs (a smaller version of the original clown shoe), and the hoopty ploopty platform Crocs which I made famous when I took a spectacular tumble at a fund raising event. All in front a large roomful of very well put together women. So, I’ve been keeping tabs on the company known as Crocs, and frankly, I don’t see them slowing down at all. I was a bit worried, since they make a shoe that is virtually indestructible, and really need never be replaced. But fortunately, they keep putting out new styles. Before I go any further, this is not a commercial for Crocs. And I’m not being compensated in any way. But I wanted to tell you what happened yesterday, when I posted about my very public mishap. Y’all know that I have a review/giveaway page. One of the reasons that I love doing giveaways is to tell moms about new products and be able to give a reader something FOR FREE! And by the same token, I know other bloggers who have giveaway pages, and I like to support them by entering their contests. ESPECIALLY IF THE PRIZE IS REALLY COOL. For example, last week I entered a giveaway for a FREE PAIR OF CROCS over at Denise’s site, Run DMT. And on the day that I posted about falling down in my Crocs, Denise e-mailed me with a suggestion that I buy myself a pair of lower shoes, BECAUSE I HAD JUST WON A FREE PAIR OF CROCS. I’m on some sort of freakish winning streak. Because that sort of thing never happens to me. And what with winning the bling bling shiny purse and bottle of Pineapple Rum at the fund raiser, well. COME TO MAMA! So, this is what I chose from Crocs.com. To match my new purse. I am going to look STYLISH when I sashay myself into Wal•Mart for my weekly grocery shopping extravaganza. 15 Responses to Save the Crocs! I can’t believe those are crocks!! That’s terrific! You GO GIRL, with your rhinestones, bling bling bag and what not! I take quite a bit of flack about it, but I wear my Crocs all. the. time. My first pair were mary janes that are multi-colored. (Like they took all the leftover colors and melted them like crayons into a delightful rainbow creation.) My daughter says it looks like someone ate a crayon box and threw up on my shoes. Nice. Those are so cool!!!! love them! Need fashion pics of you wearing said Crocs! I wear the Malindis. I did order the above pair, Olivia, in brown, but I don’t like them at all. I think the rhinestones look like a gumball machine trinket and felt ridiculous wearing them so I promptly ripped them out. I also don’t like the fully enclosed toe…the Malindi is enclosed, also, but you have at least five cutouts along it, making it much prettier and allowing your toes to breathe. I hope you like the shoes….I just really was disappointed so I’m curious to see how you feel about them. It is so nice to see someone else rocks the Crocs. I love my croc mammoths (probably not needed in Fl but needed in WV from Nov-Apr). Enjoy! I can rock the Croc Mary Jane like few people can. But seriously, I work in a pretty casual office, but not casual enough for my usual footwear of choice- the flip flop. So my Croc MJs work perfectly with capris or a skirt and are still appropriate to wear to work. Does a multi-tasking shoe get any better than that? Because it’s all about the bling-bling. Well, congratulations on the new shoes!! Ooh, those are cute! I love Crocs too. At last count I have 4 pairs. My husband thinks that’s enough. What does he know? I must say, I loved your post below. Glad you got the rum, sorry you fell, but what GREAT blog fodder! I just looked at their site for the first time. WOW! Can you say shopping spree?? Now I REALLY with you were having a give-away! Very cute!! 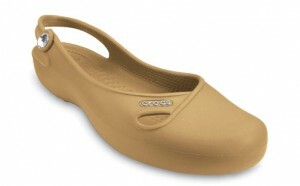 I love my Crocs, and just ordered a new pair for my daughter & myself from their website. Several months ago we had a Crocs Outlet sale happen near my house. It was Sunday afternoon, the place was PACKED and they had Crocs for $5 and under. Can you imagine my excitement?! Each of the kids got at least one pair, I got two pairs and my sweet husband who said he would NEVER be seen in a pair, bought two pairs. We had SO much fun!!! Congrats on the win! Crocs are huge over here in Japan. I would think here alone would keep the company in business.